The Day I Became a Woman (Roozi ke Zan Shodam, 2000) offers a thematic perspective on the plight of women (in Iran, presumably, and similar societies) in three separate allegorical segments. Each of the segments shows a woman at a different stage of life and the way societal restrictions severely confine her. These three 24-minute tales were allegedly planned as three short films, since the approval process for short films made in Iran is more relaxed than that for feature films . But collectively, they offer a more disturbing picture. What is distinctive about this film, though, is the surreal nature of the presentation. Although the events depicted are physically realizable, there is a dreamlike feeling to each of the stories. The film was directed by Marzieh Meshkini, the wife of noted Iranian filmmaker Mohsen Makhmalbaf, who also had a significant hand in the production. After establishing himself as a major film director, Mohsen Makhmalbaf founded the Makhmalbaf Film House in 1996, which is both a film school and a production house. Among its graduates are Mohsen’s wife and his three children, all three of whom received major film production credits as teenagers. His wife Marzieh has worked as a film director, cinematographer, and scriptwriter. His daughter Samira is a director and scriptwriter (The Apple, 1998; Blackboards, 2000). His daughter Hana is also a director (Buda as Sharm Foru Rikht, 2007). And his son Maysam is a film editor. It is not surprising then that most of the films they have produced have involved family collaboration. In the case of The Day I Became a Woman, Mohsen was the producer, Marzieh and Mohsen were the script writers, and Maysam co-edited the film (with Shahrzad Pouya). Because the experienced Mohsen was involved in all those films, some people believe that he is the real director and auteur behind all the films coming out of Makhmalbaf Film House; nevertheless, there is evidence seems to refute that claim and to credit the family members with real contributions . 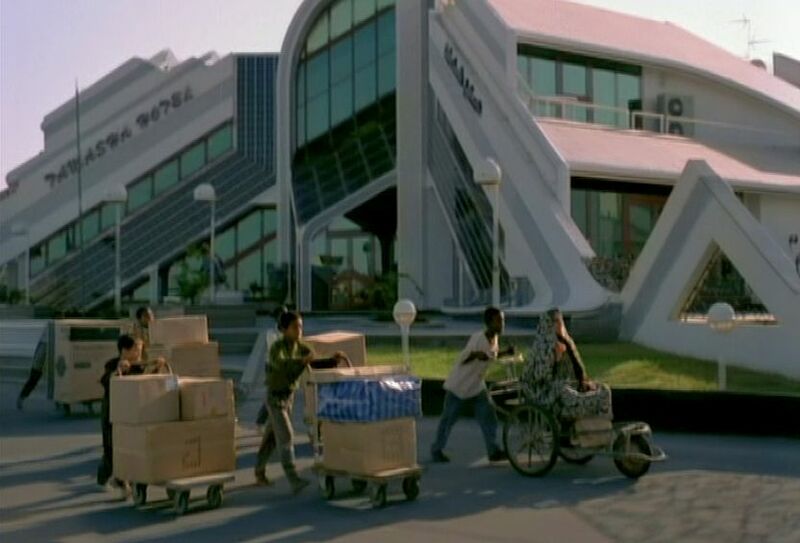 All three segments take place on Kish Island, which is an Iranian resort center and international trading post in the Persian Gulf. Because of its location, the island’s native population features a mixture of ethnic peoples and colors. But race is not so much an issue here; gender is. The first segment involves a young girl, Hava, who wakes up on the morning of her 9th birthday and is informed that she has now “become a woman”. That means that she can no longer associate with her boy playmates in the neighborhood and that she must now begin wearing the chador, a full-lengthed veil for women in Iran. After some discussion with her mother and grandmother, Hava learns that she was born at 12 noon, so she argues that she isn’t really nine years old until noon of the present day. Thus since it is now about 11 o’clock, she has one hour of freedom left. Hava rushes off to play with her best friend, Hassan, but she finds that he has been grounded at his home for not doing his homework. She goes off to buy some sweets for him, and returns just before noon to hand him some sweets through his window. Their innocent childhood intimacy is highlighted by a scene showing them alternatively licking the same Tootsie-roll pop that she holds out to him with her extended arm. Finally the high noon time arrives, and Hava’s mother arrives to cloak her with a chador and whisk her away forever from her previously open and fun-filled life. The most arresting of the three tales shows a number of women, fully clothed in chadors, engaged in a long-distance bicycle race. Apparently Kish island is (at least at that time) the only place in Iran where women are allowed to ride bicycles in public. But even there, the idea of women riding a bicycle is not fully accepted by everyone. As the women cyclists race down a country ride, a man on horseback rushes upon them looking for his wife, Ahoo, who is one of the riders. He orders her to desist from this disgraceful activity, and when she persists with her racing, he rushes off to get a mullah. When Ahoo’s husband soon rejoins the racers, he is accompanied this time by a mullah, also on horseback. Losing no time at all, the shouting mullah pronounces an on-the-fly divorce, even as Ahoo continues racing down the highway. Later Ahoo’s elder family members also ride up on horseback and insist that by participating in the race, she is ruining her family’s honor. But Ahoo continues on in the race anyway. Finally her brothers arrange an ambush for the poor woman and force her to stop so they can confiscate her bicycle. All through this segment Ahoo has very few spoken words. Her situation is expressed visually by the racing cyclists, the intrusive horseback riders, and Ahoo’s facial expressions. Because Kish island offers duty-free merchandise, it attracts lots of bargain hunters and has a large shopping center. An elderly spinster, Hoora, arrives at the airport and hires one of the numerous young boys looking for work to wheel her around the shopping area in a wheelchair. The woman has just come into a large inheritance, and her goal is to buy all the nice household items that she had missed out on in her life. In short order Hoora has a parade of young boys trucking her vast range of purchased items, which includes a refrigerator, a stove, a bed sets, dressers, and chairs. But the boy has parents of his own and is unavailable to be the woman’s adopted son. Near the end of this segment, two of the bicycle racers from the Ahoo segment arrive and gaze at Hoora’s merchandise arrayed out on the beach. Eventually all the boys are engaged to repack Ahoo’s merchandise and put it all on their makeshift rafts so that they can transport her goods to a ship anchored off the beach. At the very end we also see Hava, now clad in her chador, watching wistfully from a distance. Ultimately Hava winsomely just wanted to play; Ahoo determinedly wanted to participate; and Hoora feistily wanted finally to have a life. All three women just wanted to be and to do. But severe social restrictions got in the way. An Iranian friend complained that this film did not present a realistic portrayal of how women live in Iran. But the point here is not to present strict realism but to evoke an atmosphere, a mood. Of the three tales of The Day I Became a Woman, the first two are the more successful, mainly because they offer compelling visual metaphors of women in confinement. There isn’t so much dialogue; it is the situational circumstances, themselves, that hit home. The final tale, though, is a bit too ludicrous for my taste. The elderly Hoora is innocent in her own way – her confined life has left her with no vision of life’s richness beyond household appliances. But she doesn’t evoke our sympathies the way Hava and Ahoo do. In this regard it is interesting to consider the aesthetics behind The Day I Became a Woman and how they relate to the general production style of Makhmalbaf Film House. The beauty of this film lies in its imagery, not so much in any narrative movement of the story. The film dwells visually on fascinating situations, which don’t really evolve much. Yet these situations are elegantly portrayed. This might lead one to imagine the contrast between visual imagery (which might suggest paintings) and written text (which might suggest stories, hence narrative movement). Does this imply that Makhmalbaf Film House focuses on the visual image over text? Not necessarily. It’s a bit more complicated than that. In fact film critic Jonathon Rosenbaum has compared Mohsen Makhmalbaf to Abbas Kiarostami and noted that Makhmalbaf started out as a playwright and has published many of his film scripts, while Kiarostami started out as a graphic artist and rarely uses a script . Yet the films of wordsmith Makhmalbaf are more static, while Kiarostami’s scriptless films have more narrative evolution. This is where effective collaboration may have come in. It seems that Mohsen Makhmalbaf’s script contributions to The Day I Became a Woman were merely sketch outlines, while his wife Marzieh Meshkini filled in the visual details . And it in this area, particularly in the first two segments, where the film excels. So the authorial stamp of the film may come primarily from Marzieh. “Eastern societies face a number of elementary problems in spite of their rich cultural backgrounds and their exotic charm. Being a woman constitutes one of those problems – so much so that people begin worrying about a baby girl from the moment she is born, and at times the mother is consoled with the expression of hope that her next baby will be a boy. Women are given minor roles in society, and consequently they are transformed from producers into mere consumers and burdens to the productive segment of the society. That is why the birth of a girl is considered an increase in the number of consumers of the family income. At the same time, the attitude of society toward women is emotional; women are either mothers or mistresses, and that is why every man tries to gain exclusive possession of his mother and his mistresses. As a result, home becomes the safest place where women can be preserved. But of course it is not text like the above, however eloquent its expression may be, but those visceral images in the film that long linger in the mind after seeing this film. Marrit Ingman, “The Day I Became a Woman”, The Austin Chronicle, (18 May 2001). Jonathon Rosenbaum, “The Day I Became a Woman”, Chicago Reader, (6 April 2001). Marzieh Meshkini, The Day I Became a Woman, Olive Films, 2005. Throughout his filmmaking career Satyajit Ray was interested in expanding his cinematic repertoire and experimenting with different styles. Nevertheless, there was always a special and recognizable “Ray” feeling in all his works. So it was with his Abhijan (The Expedition, 1962), whose melodramatic flavor contrasted with Ray’s earlier more inward-looking films. In fact it was probably that melodramatic tenor that made Abhijan Ray’s biggest box-office success in Bengal. Another reason for its success was the presence of Bollywood film star Waheeda Rehman (Pyaasa (1957), Kaagaz Ke Phool (1959), Chaudhvin Ka Chand (1960), Sahib Bibi Aur Ghulam 1962)) in the film. Indeed her relatively small role (as far as screen time is concerned) provided the crucial pivot in the narrative. The story of Abhijanis is based on the 1946 novel of the same name by celebrated writer Tarashankar Bandopadhyay and concerns the struggles of a taxi driver to get the respect he feels he deserves. Ray fashioned the screenplay from the novel, which had been introduced to him by his producer friend Bijoy Chatterjee. 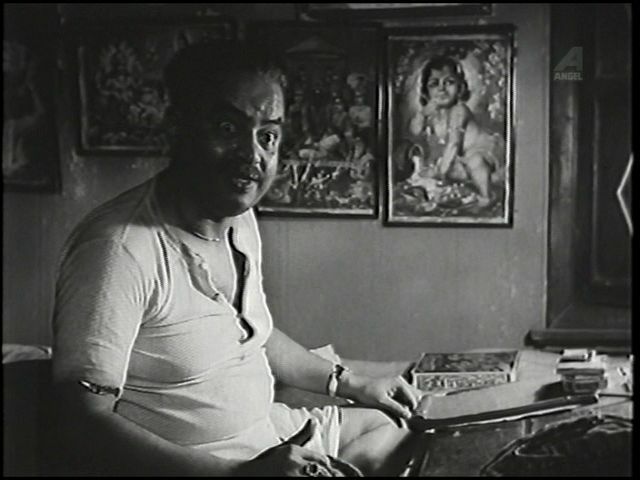 Since Ray was occupied with the production of his Kanchenjungha (1962) at the time, it was his original intention to have Chatterjee direct the film with Ray acting as a consultant. But when shooting was to start, Ray, with the encouragement of Chatterjee, took over the direction himself . Ray’s resulting film has sometimes been compared to Martin Scorcese’s Taxi Driver (1976), because of some superficial similarities between the two respective loner taxi-cab driver protagonists and also because Scorcese has long been an admirer of Ray. However, I think the two films follow quite different paths. 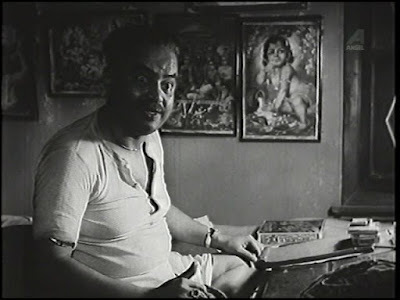 In Abhijan, the protagonist, Nar Singh (played by Ray favorite Soumitra Chatterjee), is obsessed with dignity . He craves admiration and respect from those around him, which he feels is his due, since he is a Rajput and thus a member of the Kshatriya (warrior) caste (varna). However, Nar Singh has to struggle to eke out a meager existence as a taxi driver. His only possession of note is his vintage 1930 Chrysler sedan, which tends to attract the eyes of wealthy customers. At the outset it is also revealed that Nar Singh’s wife had left him, adding further insult to his self-esteem and leaving him as a thoroughgoing misogynist. 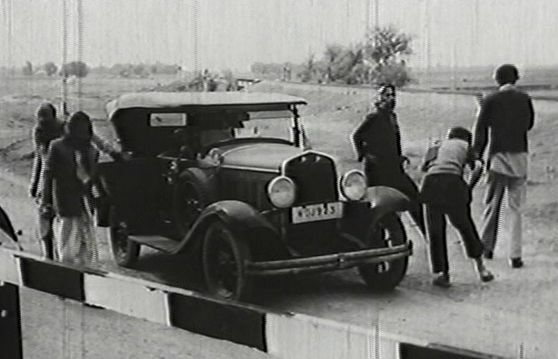 This is shown in the film’s curious opening shot, which lasts 2:35 in fixed frame. 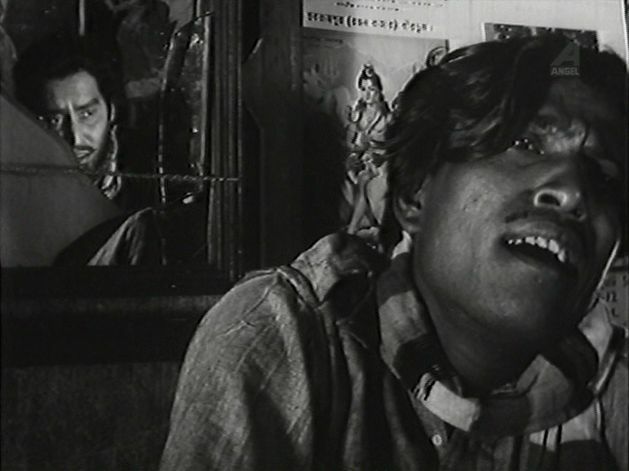 It shows a man, who will not be seen in the rest of the film, in closeup talking to the grumpy Nar Singh, who is seen only obscurely in the background through a broken mirror. Nar Singh expresses his pessimistic view of the world in this shot, but we never learn much about his background. All we really know him is that he is Kshatriya and that he owns that vintage Chrysler. Ray’s treatment, in contrast to the novel, which apparently provided considerable background material about the principal characters, simply plunges the viewer straight away into the issues at hand . The story that follows has four sections to it. After that opening shot, the rest of the first section shows Nar Singh’s life as a frustrated taxi driver who wants to show off and get some respect. One of the only ways for Nar Singh to boost his ego is by driving his Chrysler at high speeds on back roads, recklessly overtaking slow drivers, and even racing railroad trains following a parallel path. Eventually, he goes too far, by recklessly overtaking a car carrying a Sub District Officer. The SDO is incensed by Nar Singh’s audacity and immediately revokes his local taxi license. Nar Singh grumbles to his loyal assistant/mechanic Rama (Rabi Ghosh) that he would have groveled for mercy before the hot-headed SDO, but the Kshatriya blood flowing through his veins prevented him from doing something so humiliating. Now without a source of income, Nar Singh is even more depressed, and he glumly decides to drive back to his local district of Giribraja. 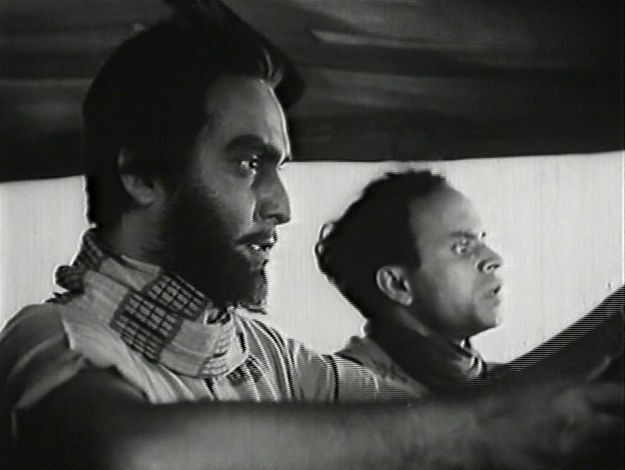 On the way, he encounters a stranded traveler, Sukhanram (Charuprakash Ghosh), who is willing to pay him to take him to another town, Shyamnagar. 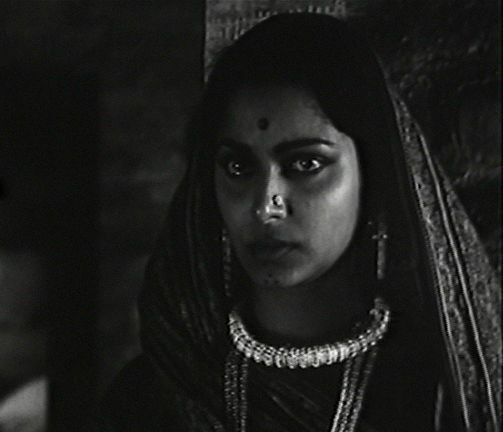 Because of his grudge against all women, Nar Singh baulks at taking the man’s maidservant, Gulabi (Waheeda Rehman), but he goes ahead when the traveler offers him extra money for her. When they get to Shyamnagar, Sukhanram says he will help Nar Singh set up a potentially lucrative taxi service between Sukhanram and the nearby town of Panchmati. Then Nar Singh runs into a man, Josef Rajani Dash (Gyanesh Mukherjee), who turns out to be a distant cousin of his. 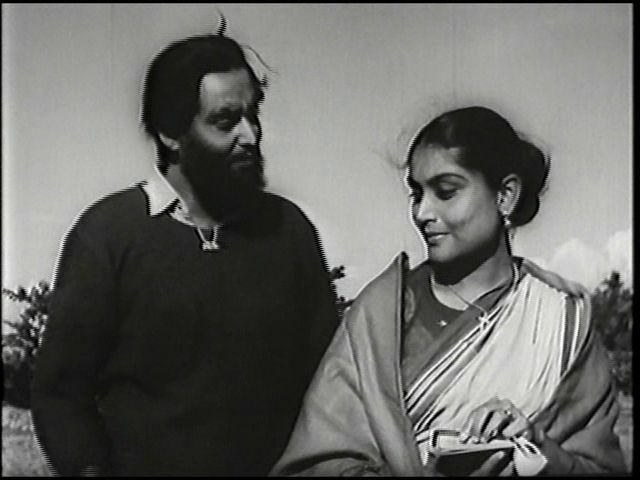 Josef is very amiable towards the somewhat sullen Nar Singh and invites him to his modest home, where he meets Josef’s mother and his sister Neeli (Ruma Guha Thakurta). Caste consciousness is significant here, especially for Nar Singh. Even though he is poor, Nar Singh considers himself above others because of his high caste status. While Sukhanram is evidently rich, he is from the Marwari caste, an ethnic group traditionally involved in trade and often considered by ordinary people to be “shifty”. Moreover, the local taxi and bus drivers of Shyamnagar, who are lower class, resent the intrusion of this proud stranger and his fancy car into their midst. In addition, Josef and his family are from a bottom-level caste, and they have fallen even lower in the caste reckoning by dropping out altogether and converting to Christianity. Despite his caste consciousness, though, Nar Singh is immediately attracted to Neeli and softens his usually surly demeanor whenever he is around her. With Sukhanram’s lucrative offer in mind, Nar Singh decides to hang around Shyamnagar for awhile. He spends the night in Sukhanram’s work shed, where he is soon visited by the beautiful maidservant Gulabi. It turns out that Gulabi is kept around by Sukhanram to serve as a prostitute, and she is seeking shelter for the night from Sukhanram’s client predators. Nar Singh is indifferent to her situation, but he passively allows her to spend the night in the corner of his shed. There are now three different spheres of interaction for Nar Singh, and they offer different moral perspectives. Although Nar Singh looks down at Gulabi as too low for his high-caste status, she takes his reluctance to ask her for sexual favors for the evening as a sign of almost heavenly virtue on his part. She offers to be his mistress, if he is willing. But Nar Singh’s romantic interests are directed towards Neeli, and he asks her about sin and punishment from the Christian perspective. She tells him that whether one is “lowly” (as Nar Singh considers the status of Josef and Neeli to be) is solely determined by one’s inner nature, not by one’s caste. Her words seem to have an effect on Nar Singh. To Nar Singh’s shock, Neeli approaches him after a ride and asks him to help her elope with a crippled Christian boy, Ajay, that she loves. To Nar Singh, Ajay is at the bottom of the dignity scale, with no chance to earn a decent living or command respect. And yet Neeli has chosen him! After reluctantly helping them escape, Nar Singh returns that night to his shed drunk and tells Rama to summon Gulabi for him for the night. The next morning Gulabi lovingly tells him that she is his, and she sings a song for him. Immediately afterwards, she relates to him how she was raped (which apparently had caused her family to sell her into prostitution) and had almost committed suicide afterwards. Her last-minute decision not to do so, was because she still felt life had something magical in store for her. Then she proposes that the two of them run away together and get married. This extended scene displaying Waheeda Rehman’s charm is the most charming sequence in the film. But Nar Singh is still indifferent. He tells her that he wants to stay around and exploit his chance to make money and heighten his dignity. He goes to Sukhanram to sign a contract for his part in the illegal opium trade. When first Gulabi, whom Sukhanram is about to sell off as a concubine, and then Josef learn what Nar Singh has done, they reject him. Nar Singh’s response is only anger – these are the two people who had shown him the most respect up til now, and now they are evidently disrespecting him. He strikes Josef down and is about to walk away, when he has a last-minute change of heart. Perhaps the words of Neeli come to his mind about who he really is. In the final scenes he rejects his opium delivery mission and rescues Gulabi from Sukhanram. As he drives away, he calls to Josef at the side of the road that they should soon rendezvous in his home town of Giribraja. Though Abhijan was a big success for Ray, it does have some noticeable weaknesses. 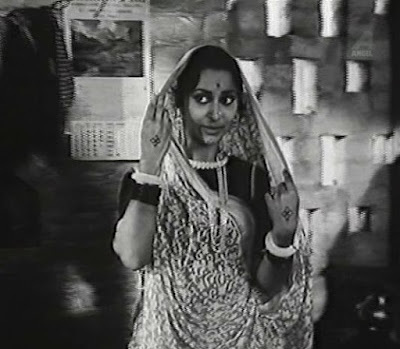 Although the film’s box-office success was significantly due to its being a melodrama, the two most melodramatic scenes in the film are ineptly staged, shot. and edited. This despite the fact that Ray apparently spent much time shooting and editing these scenes . The first one is a fight that takes place between Nar Singh and the hostile bus/taxi drivers of Shyamnagar. The entire sequence is confused and chaotic, without any discernable progression to what is happening. 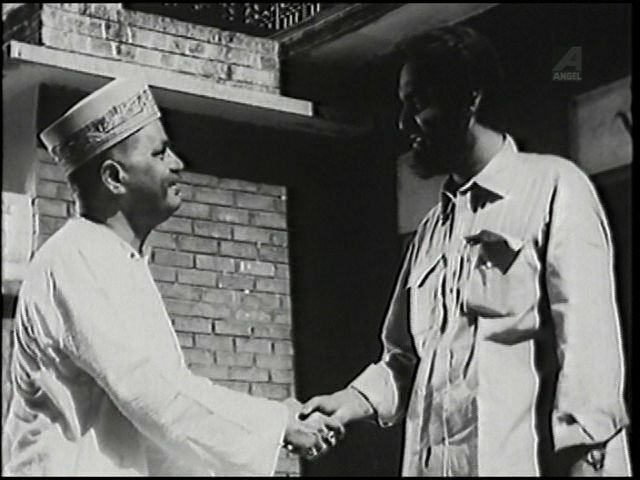 The second melodramatic misfire concerns the confrontation that Josef and Nar Singh have at the end. Again it seems awkward and confused. Another weakness is the sudden turnaround that Nar Singh makes at the end of the film. This is too abrupt and not well motivated. Evidently action sequences were not, at this point in his career at least, Ray's forte. Nevertheless, there are strong points, of course, to the film as well. Ray’s usual humanistic tone is mostly evident throughout. This is enhanced by the musical score that was composed by Ray. The casting of Soumitra Chatterjee in the role Nar Singh, the decision for which I understand was originally made by Bijoy Chatterjee , was an apt choice. Soumitra Chatterjee always brought a reflective tone to the roles he played, and this provided a useful rounding to the otherwise overly self-obsessed character of Nar Singh. Waheeda Rehman added a delightful element to the film in her role as the embodiment of unconditional love. She provided the light that Nar Singh eventually found inside himself. I have commented elsewhere about the pseudo concept of “dignity”. See for example my reviews of The Last Command (1928), Bicycle Thieves (1948), and Pyaasa (1957). Marie Seton, Portrait of a Director: Satyajit Ray, (1971), Indiana University Press, pp. 213-229, 251-260. Heaven (2002) is a romantic thriller that fascinatingly features the combined virtues of its two talented creators, Tom Tykwer and Krzysztof Kieslowski. Film director Tykwer presents this tale with the visually kinetic flare one would expect on the basis of his earlier work (Winter Sleepers (1997), and Run Lola, Run (1998)). But it is Kieslowski’s story/screenplay (co-written with his usual coauthor, Krzysztof Piesiewicz) that makes this film stand out from other thrillers and raises it to another level. Kieslowski had intended this to be the first part of a trilogy, whose other two parts were to be Hell and Purgatory, but his death in 1996 prevented him from completing that project. On the surface, the story may seem to be simple and outlandish. A woman seeking revenge for her husband’s death by drug overdose attempts to assassinate the drug kingpin behind her husband’s addiction. However, her assassination attempt goes awry and leads to the deaths of four innocent people instead of her intended victim. She is immediately arrested and confesses to her crime. But while she is testifying to the police in custody, a low-level police officer becomes enamored of the woman and tries to whisk her away to safety. Most of the film is devoted to his lone efforts, in the face of impossible odds, to somehow rescue this women from the punishment that seems to be inescapable. Just looking at the plot on that level, the story may seem preposterous and morally questionable. Why should we be interested in helping a confessed murderer escape facing the consequences of her act? Indeed film critic Roger Ebert questioned the morality of the story for this reason . But if you are familiar with Kieslowski, you know that he sees human engagement in all its inscrutable and multifaceted complexity. In his acclaimed ten-part television series, Dekalog (1989), Kieslowski had earlier explored the range of the Bible’s Ten Commandments and the extent to which it is ultimately impossible to formulate a fully structured logical framework for moral and ethical behaviour . What is invariably needed to complete the picture is an injection of the mysterious powers of love and compassion. This territory is explored further here in Heaven’s fantasy-tinged theatrics. the contingent nature of existence: the degree to which chance governs our existence and the consequent extent to which we are to be held responsible. At the outset of the film, an Italian police officer, later identified as Filippo (played by Giovanni Ribisi), is being given helicopter pilot training by means of a flight simulator. At the end of the training session Filippo elevates the simulated helicopter upwards indefinitely, at which his instructor remarks, “in a real helicopter you can’t just keep flying higher.” Filippo then asks, “how high can I fly?” Indeed, that is the question concerning contingency that will be put to the test. Then the film turns to the assassin, Philippa (Cate Blanchett), and her attempt to set a time bomb in a high-rise office building that is intended to kill a corporate executive, Mr.Vendice, who she knows is a clandestine drug overlord. It is all carefully planned; but happenstance intervenes, and the bomb is accidentally moved so that when it detonates, it kills four innocent people and not Mr. Vendice. Philippa had been trying to get the Carabinieri, the Italian national police, to take action against Mr. Vendice and had identified herself to the police force on numerous occasions. What she did not know was that the police had corrupt elements who were in on Vendice’s drug trade. These people had suppressed her revelations and when the bomb wet off, they knew who was responsible and immediately had Philippa arrested. It is only at this point, eleven minutes into the film that the film titles appear. Although Philippa is clearly guilty of the killing, she is brought to the prosecutor at the Carabinieri headquarters to make her own statement, and she uses the opportunity to reveal, once again, what she knows about Mr. Vendice. Since Philippa is English (she works in Italy as an English teacher), she wants to testify in English. So Filippo, a young police clerk in attendance who knows English, is recruited to be her translator. What none of them realize is that also in attendance at her testimony is Major Pini (Mattia Sbragia), who is in on the drug corruption and wants to see Philippa and her “evidence” eradicated. While testifying to the prosecutor, Philippa is overcome with horror of her crime and faints to the floor. Filippo bends down to attend to her, and when he looks into her eyes and holds her hand, he falls in love with her. Philippa is unaware of this event, but from here on, Filippo is quietly but unreservedly in love. Filippo is now faced with an apparently hopeless task: to save his beloved who is imprisoned for a confessed heinous crime. The rest of the film covers his efforts, which are divided up into five “operations” – we can call them ops, stratagems, gambits, capers, maneuvers, whatever – I will call them “ops”. Each of the ops faces impossible odds against success and relies on fortuitous circumstances to come out just right. In fact the infinitesimal likelihood of success for each successive op seems to decrease as we move forward in the story. But love, not practicality, is the driver in this tale. Here, too, there is improbability, but as the story unfolds, the viewer is drawn into the relentless train of unlikely contingency that drives the action..
First, Filippo needs to communicate surreptitiously with Philippa. Through an extraordinarily contrived electrical accident, he sneaks a small tape recorder into Philippa’s pocket during one of her testimony sessions. When she listens to the tape back in her cell, she learns of his plan and records her willingness to proceed. 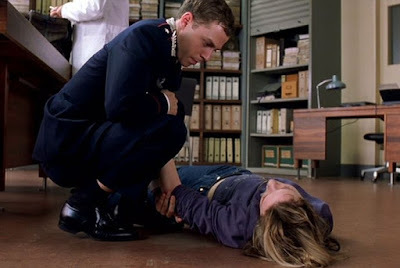 However, the chances of Filippo’s plan succeeding take a devastating hit when we learn that the Carabinieri secretly record everything that goes on in Philippa’s cell; so they know all about Filippo’s intentions. Filippo has a plan to sneak Philippa up into the unused attic of the police station. This caper is even more outlandish and unlikely, but it is successful. In the evening when Filippo goes to join Philippa in the attic, she tells him that the only reason she is cooperating with Filippo is to see if she can have one more opportunity to murder the drug operator Vendice. Filippo’s love for Philippa is without reservations, and he is totally committed to helping her, despite her apparent dismissal of lawful solutions to her frustrations. In that evening he sneaks her into the office of the corrupt Carabinieri Major Pini and then, pretending to be a Pini assistant, manages to convince Vendice to rush over to the office that very night. Again there are lucky circumstances, but everything breaks in Filippo’s way, and Philippa does kill Vendice. 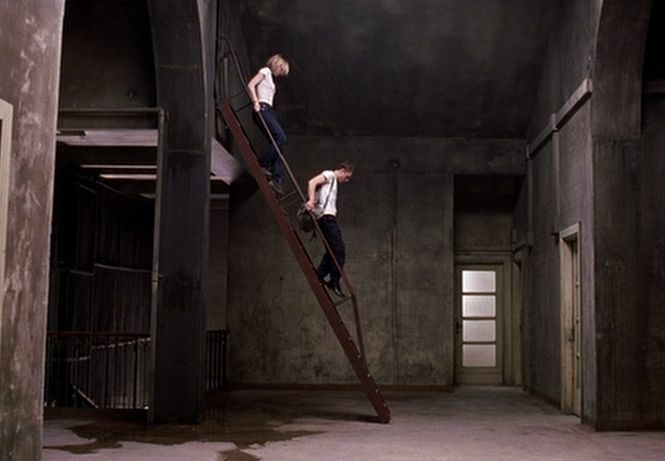 After spending the night in the police headquarters attic, they still have to figure out a way to escape from the building, which is full of police looking for the two missing fugitives. Early in the morning they sneak down to the garage and jump into the back of a milk delivery truck that is making its rounds. The fact that they could find a spot behind some milk cartons to hide is something that Filippo is unlikely to have foreseen. When the milk truck, still making its rounds, passes near the train station, the two fugitives jump out the back and get onto a train headed for the Italian countryside, where one of Philippa’s good friends lives. In the small picturesque town of Montepulciano, they are less likely to be identified, and things are more relaxed. Philippa and Filippo enter a church, and while sitting in the pews, Philippa “confesses” to Filippo about all the past wrongs she has committed in her life. She tells him that she has “ceased to believe’.When Filippo asks her in what she has ceased to believe, she tells him, “sense, justice, life, . . .”. This is a real Kieslowski moment. It is at this point that he tells her that he loves her. He does not want to possess her; he wants to become “one” with her, and this metaphorical union is progressing by degrees. Their names are similar, their clothes are similar, and in order to lessen the likelihood of identification, they go to a barber and get their heads shaved. So now they look very similar, too. Filippo’s father (Remo Girone), who is a senior policeman and sympathetic to his son’s plight, arrives in the town and tells them there is now a massive manhunt throughout Italy in search of them. He offers to help them return to society, but Filippo and Philippa swear by their now mutually-confessed love and say they will struggle on alone. Filippo and Philippa make it to their sympathetic friend’s countryside home, and that evening in the beautiful countryside surroundings, they consummate their love. 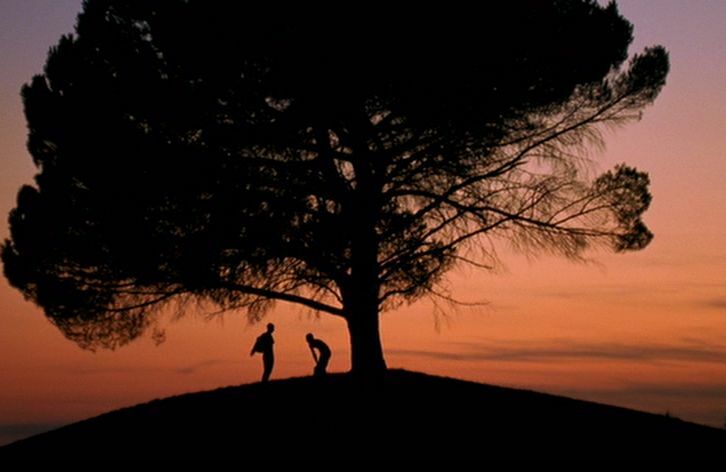 This is movingly presented by Tykwer in three successive long shots (roughly 30 seconds each) showing the two of them reveling in nature's wonders and each other. In the morning a massive and heavily armed Carabinieri SWAT team arrives. This leads to the final and most improbable escape yet. They sneak onto a momentarily unattended Carabinieri helicopter and take off as the film ends. We never know what happens to the two protagonists, so the adventure story, as well as the morality tale, are incomplete. But the love story has reached its dramatic fulfillment. And love is ultimately what the film is about. The production values of Heaven are of a high order. 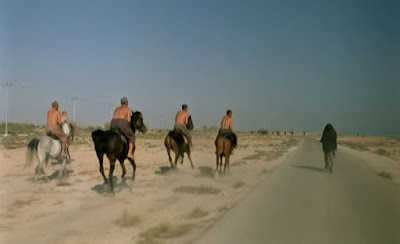 In particular Tykwer’s camera work, editing, and narrative pacing are all superb. Also excellent is the acting – especially that of Cate Blanchett, Giovanni Ribisi, and Remo Girone. They manage to make what is essentially a fantasy seem real. However, the moral side of this tale, to the frustration of some viewers, is set aside for the consideration of more personal and existential concerns. The probabilistic unreality of some of the film’s sequences make one wonder about the degree to which life is governed by chance or by some higher authorities. 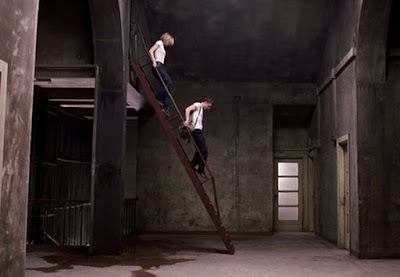 This consideration is enhanced by Tykwer’s occasional downward-looking aerial shots, suggesting a perspective outside the scope of the human participants. And love seems to be part of this equation. In fact the eternal mystery and magic of love come to life in this film as it unfolds. How could Filippo love Philippa so suddenly? Moreover, Filippo is seven years younger than Philippa, and both his natural reticence and the constraining circumstances give him no opportunity to show himself to her. How could she come to love him? It is the artistry of the contributors to this film that make it come to life and help us see that love is just as much a driver of this world’s experiences and truths as nature’s mechanics. Roger Ebert, “Heaven”, RogerEbert.com (18 October 2002). Episodes 5, 6, and 8 in that 10-part series relate most closely to the moral issues covered in Heaven.